This is a fundraiser for the NGMBA. Singletracks and Mulberry Gap are hosting the annual Singletracks event from March 23-24. The event is formerly known as the Brutal Loop but they have expanded the event to a full weekend and are calling it the Ride-N-Rally. We are in need of a few more volunteers to essentially act as ride leaders for gravel and single track routes. Singletracks.com will cover the afternoon meal and throw in some swag from sponsors. They are donating all proceeds from their raffle to the club, similar to how Brutal Loop use to work. We’re looking for 3-5 volunteers for Saturday and 3 on Sunday. You can read more about the weekend here and to see the scheduled itinerary. For those interested in assisting, they can reach out to Leah Barber from Singletracks.com (leah@singletracks.com). Please join us for a workday at Longbranch Trail, Aska Trail System, Saturday February 23, 2019 9a - 1p. We will be cleaning drains to maintain and improve drainage on the northwest section of the Longbranch Loop. We will work rain or shine. Drains that we cleaned last year are still functioning even with all the rain we have had for the past year. Click on this LINK for more info and to sign up. The long awaited Fruitkof new trail project, Aska Trail System is moving into the next step of development. We had a bit of a set back with the government shutdown but the project will be out for public comment soon. We will be sending out the link to comment and more information as soon as we get it. The FS biologist is reviewing the biological survey and the archeological survey will be performed soon. The Fruitkof new trail project is about 9.5 miles, about 5 miles of beginner trail, 3 miles of intermediate trail and 1.5 mile reroute of the Green Mtn Trail all located at the end of the Green Mountain Trail. The North Georgia Mountain Bike Association (formerly known as EMBA) is a non-profit mountain bike advocacy organization that maintains over 50 miles of awesome old school trails in Pickens, Gilmer, and Fannin Counties. 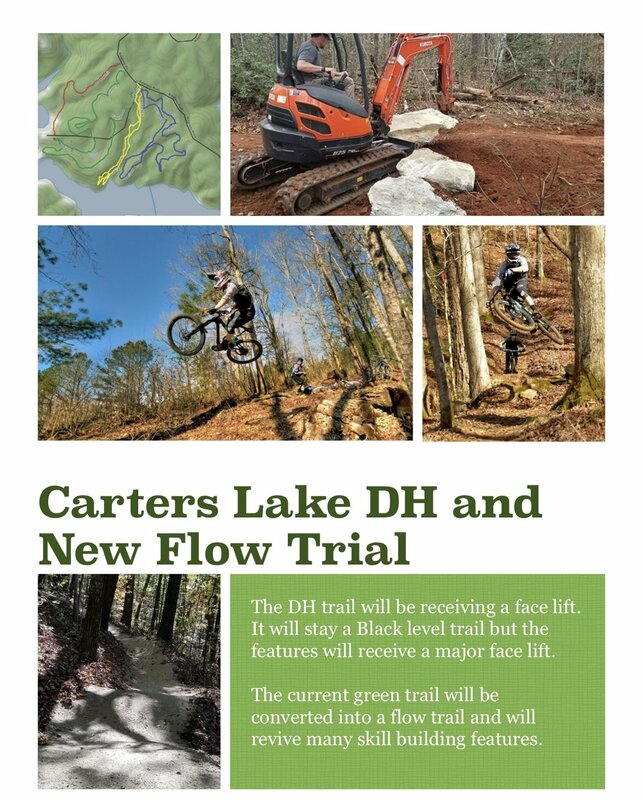 New trail projects; Talking Rock Preserve, Carters Lake and Frutikof are designed to enhance the riding experience and support a variety of mountain bikers from beginners to gravity riders. One of the original SORBA chapters, NGMBA developed some of the first mountain bike trails in the Southeast. Your support by joining/renewing is greatly appreciated. Copyright © 2019 North Georgia Mountain Bike Association - A Chapter of SORBA-IMBA, All rights reserved. The Election results are in and Andy Milton won his bid for president. Special thanks to Larry for his efforts and support of our club!! 1. Bring our community together for a stronger club. 2. Create and bring more trails to our area. 3. Improve our trails we have now. 4. Have fun and ride our bike. We are in this club to have fun and ride so we need more social events and rides. 5. Keep our members informed and in touch which will help achieve these along with so many other goals. Again thank you for your support and if you have any questions or would like to offer any suggestion please feel free to email me, I welcome all. The new nominees for the Board of Directors are as follows in the list below. Those running unopposed will take over or continue board positions in December at the Annual Christmas Party. For the first time, we do have 2 very qualified candidates for president and members can vote for the one they think will best lead the chapter for the next 2 years. Below are photos and bios of the candidates for president. Please click HERE to vote your choice and please include your name. Only NGMBA members of good standing can vote - family memberships can have two votes that need not be the same. All votes are confidential. Voting will commence from now until November 30, 2018 11:59p. Mountain Biker: I bought my first mountain bike in 1993, a purple Bridgestone MB-2, with a crown fork and friction shifters, and I was hooked from the first time I rode down Repack on Mt Tamalpais in the San Francisco Bay Area. In those early years, I served on the Mount Diablo Mountain Bike Patrol, bike commuted across the Golden Gate, eventually relocating to Georgia where I rode the Civil War breast works on Dug Gap Mountain and Snake Gap, helped build and race on the trails at Carters Lake (Woodring Branch and the Downhill course running alongside the Dam), raced at MOE at the Downhill Dual Slalom course, and rode Bear Creek for the first time around 1993 with Jim Parham’s first edition Off the Beaten Track. Since then, my bride and I have ridden from Molokai to Chocolocco, now spending time showing our kids the same trails that have enthralled us for over 20 years. Professional: As a career active-duty Commissioned Officer with the United States Public Health Service (CAPT, O-6) for 19 years, I have responded to health crises around the world. Currently stationed at the Centers for Disease Control in Atlanta, I am responsible for a chronic-disease prevention portfolio that targets Type 2 Diabetes prevention in American Indian populations. A Board-Certified Nurse Practitioner, I have served in varied roles including providing direct patient care, Clinic Manager, Project Officer, Grant Reviewer, author, and Team Lead. My passion for cycling stems in part from sharing the salutary effects of the sport with others and seeing the power of chronic disease prevention manifest in those who cycle regularly. Personal: Married to my bride Laura Lea for 23 years, we have six children and have lived in Ellijay for 10 + years, though we have been visiting and riding in Gilmer County for over 24 years. Grounded in our Christian faith, we are members of Grace Community Church in Dawsonville. In 2017, Laura Lea and I started the Gilmer Composite Youth Mountain Bike Team. Team Cartecay has grown in size to 25 student riders, and currently enjoys a ranking of 8th (Division II) in the Georgia NICA League. Broaden club membership and community voice through a shared constituency and building of collaborations with other outdoor user groups. Ensure local control over resource development decisions. Ensure intentional club synergy with local businesses whose livelihoods are connected with local trail resources and related events. Herald local trail development and the hosting of key events as prime directives for the club. Calendar, publicly announce, and assist in leading advance preparation for community signature events. Build club cohesion through clear communication, organized dissemination of information, and a commitment to establishing a club culture of enjoyment, as well as promoting enjoyment in the out of doors. Thank you for the opportunity to be considered for president of our local SORBA chapter NGMBA . I am, as many of you know, a local boy to Ellijay and as such, very interested in our community. As a lifelong resident and an outdoor enthusiast, mountain biking was a perfect fit for me. I originally started mountain biking in the late 90s and in the last 8 years have become very involved with our club. I have served on the board as Vice President for a few years now and during this tenure I have learned a lot about our club and the work that goes into gaining access to new sustainable fun trail, which in the end is what we all want. I have been involved with land managers, business owners, other organizations and local government in meetings to promote and help secure our interests in our public lands. These trails and proposed trails take a lot of hard work and time to keep up and come to fruition. Land managers depend on our help and expertise and they welcome it. I have had training on basic trail building and design, trail building machines, crew leader and understand the goals and objectives of our varied land managers to provide the expertise needed to effectively partner with them. This helps us as a club to be taken seriously. Managers like the fact we know and have some knowledge of what their view points are. This knowledge will help me if elected, to perform my duties and direct the club. As for me and who I am outside of mountain biking - I have been self-employed for many years in several businesses in Gilmer County. A furniture and appliance business for 10 years. Appliance repair Buisness for 18 years. Construction business for 30+ years. And real estate for many years too. I have served on my POA board and presided over it for a year. I have 2 daughters and 2 grandchildren. And of course a wonderful woman who is my strength Joan my wife of 17 years. I will ride a bicycle about 3000 miles this year. I would be honored to serve if elected. I look to fill our member's needs for more communication, bring the mountain bike community together, and more fun club activities such as socials, events, workdays and rides. There has been a lot of work that went into several new trail systems: Talking Rock, Ridgeway and Fruitkoff (Aska) and more new opportunities in the pipeline. Trails take time and effort neither are easy and I am dedicated to continuing the advocacy needed to create great mountain bike trails for our community. The classic Ridgeway Trail System at Carters Lake is getting some major upgrades. Construction is currently underway, and we expect the new downhill and flow trails to be open within a few weeks.